Alys: Rainbow, just checking in. A: I can see that. R: That’s good because I can’t see very well. A: Can you hear me? R: No. And I can’t see you very well either. A: So how do you know I’m here? R: My sense of smell works as good as ever. A: What do I smell like? R: The outdoors. The sun and the wind mainly. R: No. Actually, you smell like horses and goats and chickens and dog. R: Yes, these are smells I am familiar with. A: So how do I know you aren’t imagining them? R: I could be imagining them. A: It does not matter. It is what I smell like these days. R: We have been together a long time. A: Do you remember how we first met? R: Like it was today. A: You were young and running around in a field. You followed me to Fremont Hot Springs. R: And you ditched me. R: And I ended up in an animal shelter. R: And you found me. R: And we had many, many adventures together. A: Yes. What was your favorite? R: Didn’t ever have a favorite. R: I liked hanging out with you and Pete. 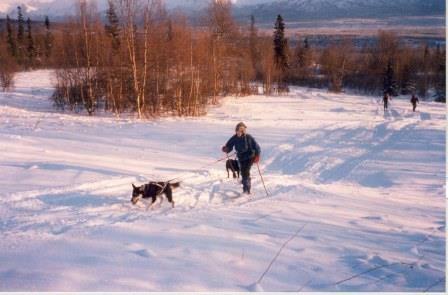 A: And in the winter we took you skijoring. R: And I enjoyed that too. R: Yes, lots of memories. A: Undoubtedly you’ve heard Pete and me talking about you. R: Yes, every single word. A: We are putting a number of plans on hold, so that we can be with you. R: You know, I really appreciate it. A: We know you do. R: I’m not yet wanting to leave either of you. A: And we aren’t wanting to let you go. R: But in the near future, I am going to have to go. A: And where do you think you are going? A: I don’t know either. But I suspect that wherever it is, you will again be young and mobile. R: I would like that. Not being able to get around is frustrating. My back legs just will not hold me up. R: I like it when you feed me off the spoon. A: And I like giving you an assist. R: And I really like being fed Cheese Whiz. A: Even though . . .
R: Yeah, even though you put my pills in the stuff. A: The pills – they are to reduce inflammation. R: I don’t know if they are doing me any good. But it does me good to know they are doing you good. A: Works both ways, doesn’t it? A: Do you think we will be together in the afterlife? R: I have no idea. But I think so. R: Gimme an ear scratch. R: Only do things that are easy.